With so many cruising areas to explore you may find yourself returning to discover yet another chain of enchanting Greek islands. Greece is still the most popular yacht charter area in the Mediterranean, and all types of yachts are available to charter; from luxury crewed mega yachts to simple bareboat charters. Delve into the lively culture at bustling taverns and modern discos. 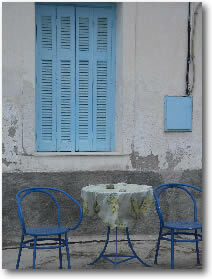 Enjoy the unparalleled Greek hos pitality in the quaint seaside villages. Get lost among ancient ruins of the dawn of civilization. Or on the comfort of your yacht deck sip on Greek wine and feast on dolmadikia (stuffed vine leaves) and tzatki whilst listening to the soothing sounds of bouzouki music drifting from the harbor village. 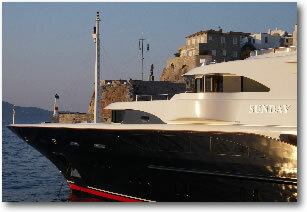 As in most of the Mediterranean, the Greece yacht chartering season runs from April through October. The high season of July and August is the hottest with often strong meltemi winds and many tourists. The recommended time to charter a yacht is during the shoulder seasons (April-May or September-October), when temperatures are comfortable, the wind lighter and there are less onshore visitors. The cruising grounds are varied with the impressive beauty and quiet charms of the Saronic Gulfto the sophistication and dramatic villages of the Cyclades, the undiscovered charm of the Aegean Islands to the east, the history and beaches of the Dodecanese or the relaxing peace of the Ionians. A sailing or motor yacht vacation is the best way to get the most of your Greece holiday. 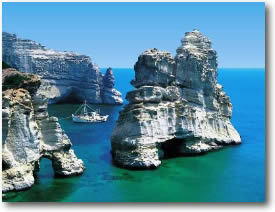 Scroll down to learn about these fascinating yacht charter cruising areas in Greece. 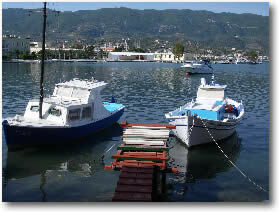 A yacht charter in this area gives you all the charms of the Greek Isles with easy access from Athens. The area includes the beautiful islands of the Saronic Gulf including Aegina, Angistri, Hydra, Poros, and Spetses as well as the unspoiled Peloponnesian Coastal villages of Epidavros, Monemvasia and Nafplion. Many of the islands have no cars, wonderful quaint villages, natural beauty, historical sites, and delicious fresh seafood. You will charmed! On some of the islands and coastal towns you can rent mopeds or horse and buggy while others such as Hydra you must depend on your own two feet as there are no vehicles. However you decide to go, you will surely delight in meandering the cobble stone streets or exploring impressive ruins that stir the imagination of days long ago. Here are some tidbits on some of the stops. Angistri ~ 17 miles from Athens, Angistri is a a small, tranquil island and a nice place for a swim or snorkel and relaxing lunch stop. Aegina ~ Perdika, a port of Aegina is a nice stop for a morning swim and relaxation then you can take a taxi and visit the temple of Aphaia (6th century BC), an example of one the most perfectly designed classical temples in Greece. 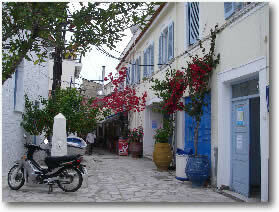 Aegina is also famous for its pottery and pistachio nuts. Poros ~ This green woodsy island’s harbor town is built on a volcanic peninsula which separates it from the Peloponnese by a narrow, shallow channel. The picturesque Zoodohos Pigi (source of life) monastery is worth a visit. Hydra ~ Hydra is a picturesque and beautiful island renowned for its maritime tradition and its contribution to the War of Independence. Hydra’ is a walk back in time. There are no cars allowed on the island so donkeys prevail and the beautiful architecture has been preserved with strict zoning to ensure that it looks almost as it did a hundred years ago. During the 1960’s Hydra was a fashionable artists colony and, today there are many art galleries. It is a wonderful place to wander in search of fine art, ceramics and an amazing exhibition of door knockers. 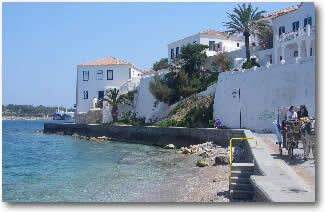 Spetses ~ a beautifully green island covered with pine trees. Bright-colored bougainvillea decorate whitewashed garden walls which enclose the pebbled yards of the island’s mansions. Charming horse-drawn carriages provide taxi service around the island, as cars are not allowed on the cobbled streets. Epidavros ~ Epidavros is a charming harbor village. 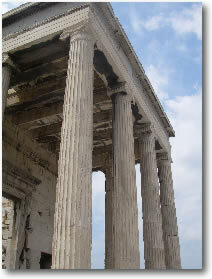 From here, you can visit the ancient theatre (about 30 minutes by taxi). Ancient Greek plays are performed in Summer during the Epidavros Festival where you can truly appreciate the perfect acoustics. We can arrange for your tickets to see a famous ancient Greek drama. You can also visit the museum and the sanctuary of Asclepious, which was a religious center for curing the sick and infirm. Monemvasia ~ One of the marvels of Greece on the Pelopennese. 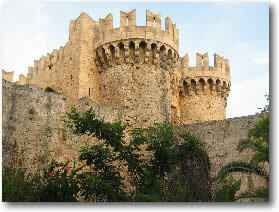 The town was one of the last strongholds to fall to invaders and features an imposing fortress. A reasonable climb from town will take you to the fortress at the top of the rock for spectacular views of the sea and the amazing church of Aghia Sophia. Nafplion ~ The first capital of independent Greece, this town is dominated by the Venetian citadel, Palamidi, a perfectly preserved example of Venetian military architecture. Shops and taverns are nestled in the narrow streets. On your way to Nafplion you may anchor for lunch in Fokiakis bay in the eastern Peloponnese, or off the beautiful sandy beaches of Tolo, a small fishing village. Cyclades When you see photos of the Greek Isles it is usually of the Cyclades making this group of 56 islands, islets and skerries in the middle of the Aegean, known throughout the world. The eggshell white “sugar-cube” buildings, blue domed churches, turquoise waters, rugged landscapes and exciting nightlife is unmistakable. But also home to the Meltemi winds that can make voyages here determined by the weather. Northern Cyclades: Kea, Kythnos, Syros, Andros, Tinos, Mykonos, Delos and Rinia. Middle Cyclades: Serifos, Sifnos, Paros, Antiparos, Naxos, Donoussa, Iraklia, Schinoussa, Koufonissia, Amorgos and Levitha. Southern Cyclades: Milos, Kimolos, Folegandros, Sikinos, Ios, Santorini (Thira) and Anafi. Each island among the Cyclades offers something inspirational and the scenery from a yacht is breathtakingly picturesque. White stone walls nestled into the arid hillsides in contrast to the strikingly blue sea will make an indelible imprint on your memory. And once you step foot on The Cyclades Islands you will be taken away by the culture, history and revelry: ancient sites, Byzantine castles, museums and exotic nightlife, shopping, dining, and beaches. If you want it all: the Cyclades will please. Below are just some of the island highlights. Mykonos – Mix with millionaires in the trendy and lively nightclubs and quaint cobblestone alley ways. 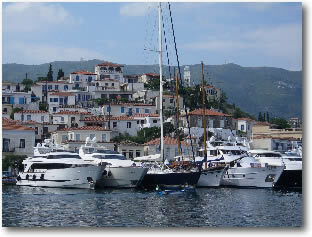 In the picturesque port you will find a comfortable gathering of small sailboats to luxury super yachts. 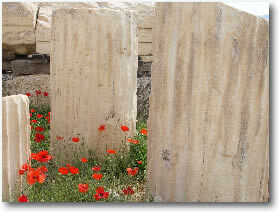 Delos – An uninhabited archaeological gem boasting the birthplace of Apollo – the god of light, poetry, music, healing and prophecy. Santorini – A geological masterpiece with extraordinary landscapes, grand heights and inspiring sunsets. Sikinos – Nestle in the charming and diverse port framed by two villages clinging to the cliffs high above. Paros and Naxos -Many consider these the most beautiful islands in the archipelago. Paros has some of the finest beaches and is famous for it’s impressive white marble and Naxos is a nature lovers dream. Dodocanese With over 50 islands, this may be the best zone in which to explore “eternal” Greece. Not only are there fantastic cities to discover but also countless beaches to be enjoyed. The Dodecanese is the most southerly group of islands in the Southern Sporades. The area includes 14 larger islands of Lipsi, Patmos, Leros, Kalymnos, Kos, Astypalea, Nisyros, Symi, Tilos, Rhodes, Khalki, Karpathos and Kasos, together with a multitude of smaller islets and rocks – plenty to see and explore on your yacht charter. Samos – The acclaimed birthplace of Pythagoras and a significant Hellenic cultural canter skirted by forested hills and lush mountainous terrain, Lesvos – Known as the canter of artistic and philosophical achievement and creativity this island remains a spawning ground for innovative ideas in arts and politics. Somothraki – walkers and trekkers will be lured by this wild and still relatively untouched paradise. The Northern Sporades on the eastern side of Greece are a very popular yacht charter area with some of the prettiest, thickly wooded, islands in the Mediterranean. However, these islands have been discovered. You can still find fantastic anchorages, though they may be busy in high season. Skiathos has become known as the Mykynos of the Sporades, and Skopelos is not far behind in popularity. Although crowded, the beaches are wonderful. Alonnisos, has managed to go unnoticed and is serene and green with an acclaimed marine park declared to have the cleanest waters in the Aegean. 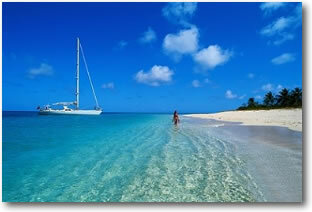 The most relaxing yacht charter in Greece, with some of the more beautiful beaches in the world. Each Ionian Island off Greces western shore, holds a different charisma and charm for a special sailing yacht charter vacation. And if you can make it in Spring when many of the islands are smothered in wild flowers all the better. The Islands that you can explore on your yacht charter include Eptanisa (The Seven Islands): Corfu, Kefallonia, Zakynthos, Lefkada, Ithaca, Paxi and Kythera. These beautiful islands line Greece’s western boarder and offer easy access for a yacht charter holiday. Due to their Italian occupation at one point, they have quite a unique style of architecture and character all of their own. Busy touristy but beautiful and colorful Corfu with its bubbling springs, golden sands, interesting caves and centuries old olive groves is not to be missed. There is much that can only be appreciated on a yacht charter holiday, like Smugglers Cove, which can only be accessed by sea at Zakynthos home of one of the most famous and stunning beaches in Greece. On the cliff tops and hillsides of Zakynthos (Zante), you can still find the real Grecian spirit among the proud and traditional locals. We recommend, if you can drag yourself from your yacht, to hire a moped and explore eternal Greece. Browse the available crewed sailing and motor yachts for a Greece Mediterranean Yacht Charter Holidays with a Yacht Search.